Nearly 800 area high-school students will take the field with the Lion Pride Marching Band for a half-time performance on Thursday, Aug. 31, as the Lions open the 2017 football season vs. Fort Hays State at Fred G. Hughes Stadium. 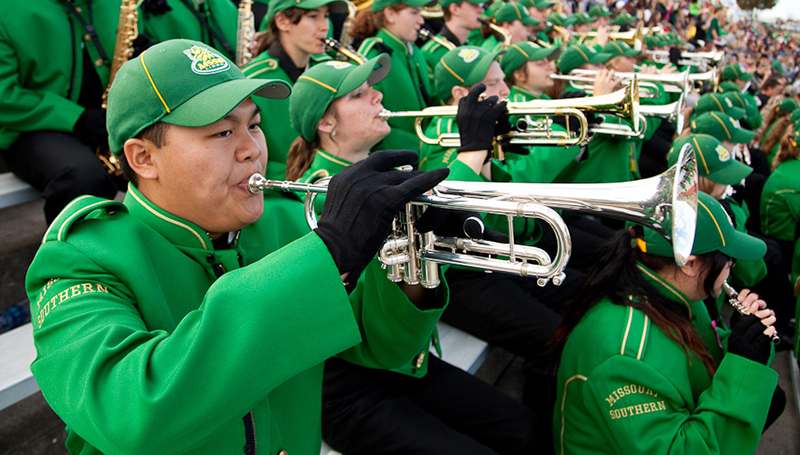 The annual Mass Band Day performance will include students from high schools in Jasper, East Newton, Exeter, Seneca, Neosho, Webb City, Joplin, Miller, Aurora and Diamond,” said Dr. Rick Espinosa, director of bands at Missouri Southern. The high-school bands will gather to rehearse the performance at 2 p.m. in the stadium. Kickoff is set for 7 p.m.
Other events scheduled at Missouri Southern include a show by mentalist Chris Carter and lectures offered as part of the Korea Semester.